We get asked this question a lot at the website and we understand it can be confusing for people who are just getting started with using Joomla. 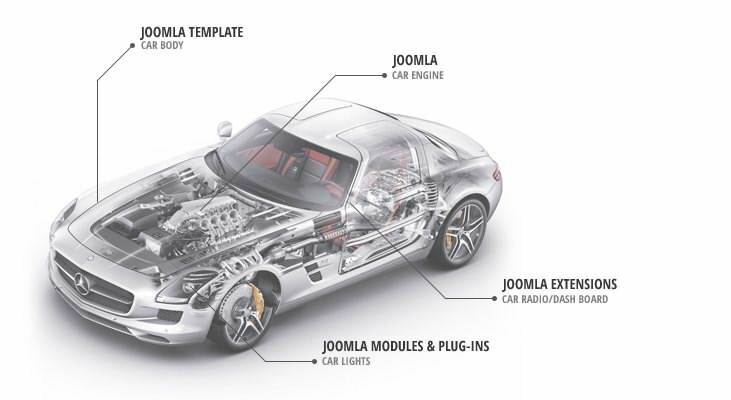 This simple car analogy will help you understand the difference between the template, Joomla, extensions, plug-in and modules. Joomla is the car engine which powers the website and allows you to create user accounts, setup menus, categories, add and publish text plus images and basically manage the overall website functionality via the administrator control panel. The lights, wind wipers, spark plugs are the 3rd party modules and plug-ins you can install via the website. To sum up the template only controls the visual presentation or look and feel of the website. All the other functionality is controlled by Joomla or 3rd party plug-ins, modules or extensions. Each Joomla template which you can download at the website comes in a zip file package format which can be easily uploaded and installed via the Joomla administrator area of your website. Once the template is successfully installed at your website you can set it as the default design or style to change the look and feel of the site. If the template includes support for additional built-in features then the built-in features can be updated via the control panel which comes supplied with the design. TemplateDetails.xml – The XML file is used to help Joomla understand the name of the template, version number plus the files and directories which need to be installed during the installation. The XML file also includes code used to setup the features the template supports via the control panel. HTML overrides – The HTML over ride files are made up of PHP and HTML files which are stored in the HTML directory and override the default Joomla content, module and other views.